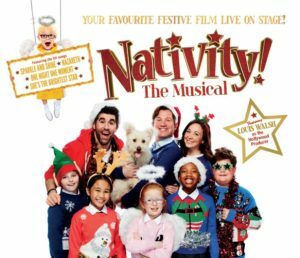 Everybody’s favourite festive film, Nativity, takes to the Palace Theatre stage as Nativity! The Musical in this truly heart-warming, wonderful production, that has restored my faith in Christmas! As you get older, it’s easy to forget what Christmas is really about – and growing up in the 90’s, I have very fond memories of Christmas as a child, but it seems the festive season has now become all too concerned with consumerism and far less concerned with the TRUE meaning of Christmas, myself included. However, after watching Nativity! The Musical last night, I genuinely feel like my faith in Christmas has been restored. Before last night, I couldn’t really have cared any less that Christmas was on the way, but after witnessing this truly wonderful production, I’m quite literally ready to deck the halls. We’re all too familiar with the biblical story, Mary (And Joseph?) give birth to baby Jesus in a stable, in Bethlehem – many people come to visit, including the three wise men, offering gifts for baby Jesus. But what the biblical story didn’t tell us is that there were also dancing and singing buildings, stars, angels, and even talking camels present for the birth ole’ baby J – and that’s not the half of it. However, when Mr Maddens gets stuck with producing this years school Nativity, he makes some promises that he might not be able to keep… that is, until Mr Poppy, Maddens crazy teaching assistant steps in to help. Those of you that have seen the film will be all too familiar with it’s plot, but I assure you that watching the story unfold live, on stage, is so much more of an enjoyable experience than popping the DVD in again. 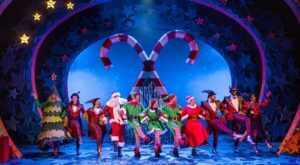 This feel-good, hilarious and engaging production is jam packed full of Christmas spirit, and features all of the favourite sing-a-long hits from the films including Sparkle and Shine, Nazareth, One Night One Moment, She’s the Brightest Star as well as a whole host of original songs. 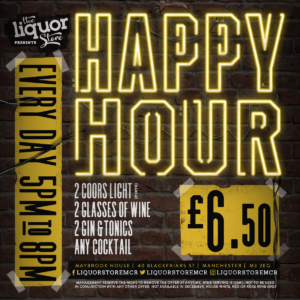 With the cast including West End stars Daniel Boys (Avenue Q), Sarah Earnshaw (Wicked, Spamalot) and Simon Lipkin (Rock of Ages, Guys and Dolls), Nativity! The Musical is the perfect feel-good comedy for all the family. 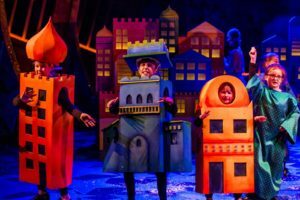 The whole cast were fantastic, with very strong vocals, and immersive performances – especially the children, such wonderful talent for such a young age. 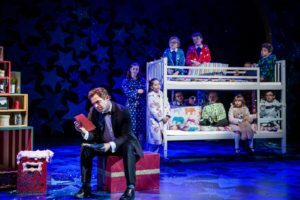 The stand out performance of the night has to be Simon Lipkin as Mr Poppy, in fact, I’m pretty sure he played Mr Poppy better than Marc Wootton did in the film! A truly talented performer, taking on the role of both narrator alongside that of Mr Poppy, such a lovable, welcoming portrayal of the character. I think everybody could do with a Mr Poppy in their lives. 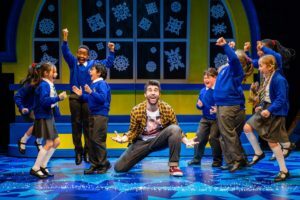 With a marvellous set design incorporating projected backdrops, snow machines, OTT costumes/props and even children flying through the air, there really would be no better way to get into the festive spirit than by going to see this production while it’s showing at the Palace Theatre. 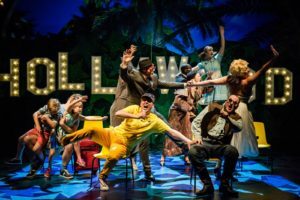 It has just as much comedy for adults as it does for children, with cheeky nods to adult humour, and truly this is a production not to be missed.